Leafminers are insects that feed on the tissue between the upper and lower epidermal layers of leaves. Leafminers can be serious problem on vegetables that are harvested for their foliage (e.g., spinach or chard). A dipteran leafminer with frass (i.e., feces) and leaf damage. Leafminers can be the larval stages of flies, moths, sawflies or beetles, but those that feed on vegetables are all fly larvae and belong to the order diptera. Common leafminer species include the serpentine leafminer (Liriomyza brassicae), vegetable leaf­miner (Liriomyza sativae) and the spinach leafminer (Pergomya hyoscyami). Appearance: Serpentine leafminer maggots produce slender, winding mines between the epidermal layers of beet, cabbage, radish, spinach, and turnip leaves. Because most of these vegetables are grown at least in part for their foliage, damage results in an unmarketable crop. Vegetable leafminers are more of a problem in greenhouse production than in field-grown crops. Greenhouse-grown tomato and cucumber transplants are susceptible. Adult vegetable leafminers are shiny yellow-brown flies with black markings. Hosts of the spinach leafminer include beet, spinach, and chard, as well as the common weed, lambsquarter. Adult flies are 1∕4 inch long, and grey with black bristles. Larvae are pale green maggots. 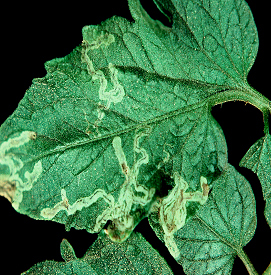 Symptoms and Effects: The damage that results from leafminer activity may appear as blisters, blotchy mines, or serpentine tunnels. Feces of larvae can contaminate leafy tissue intended for consumption. Stunting, due to a reduction of photosynthetic leaf area, can also be a problem in vegetable crops not marketed solely for their foliage. Spinach leafminers produce serpentine mines initially but later produce large, undifferentiated blotches. 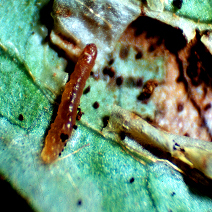 Larvae of the vegetable leafminer may feed on more than one leaf while completing their growth. Life Cycle: Leafminers overwinter as pupae either in the soil or in infested plant debris. In the spring, adult flies emerge and lay eggs on or near susceptible hosts. When the eggs hatch, larvae immediately begin to enter the leaf and mine the mesophyll tissue between the upper and lower leaf surfaces. Once the larvae have completed development, they may remain in the plant or drop to the ground to pupate. There may be several generations of leafminers per year. However, the first generation is often the most damaging. Scouting Suggestions: Early detection of leafminer damage is important in preventing a reduction in the marketability of affected crops. Adult leafminers lay eggs on lower leaf surfaces and these surfaces should be monitored carefully to detect early leafminer activity. Control treatments must be applied before leafminers enter the leaf where they will be protected by plant tissue. To date, threshold levels have not been determined for leafminters. However, on leafy crops such as spinach, lettuce, and chard, a 5% threshold level is often used. Given a lack of formal threshold levels, a plant’s growth stage is an important factor that must be considered when determining whether to implement control. Young plants can withstand less damage than older ones. Non-Chemical: Deep plowing in early spring to destroy infested weeds and plant material from the previous season can reduce the severity of leafminer outbreaks. Covering susceptible crops with floating row covers to exclude the leafminer flies from laying eggs may also be beneficial. Weed hosts such as pigweed, lambsquarter, plantain, chickweed, and nightshade should also be destroyed. Parasitic wasps can also provide a limited degree of natural control of leafminers. Chemical: Because of the protected habit of leafminers within the plant, control using insecticides is often difficult. In addition, some leafminer populations have exhibited resistance to organophospate insecticides. If insecticides are used, they must be applied early in the insect’s life cycle to be effective. For more information on leafminers: See UW-Extension Bulletin A3422, or contact your county Extension agent. Thanks to Jeff Wyman and Phil Pellitteri for reviewing this document.